Frits Popma spent 30 years flying all over the world. Fifty-four Customs authorities have stamped his passport. During his travels, he visited nearly 180 different ripening plants. “I have a lot of respect for ripeners,” he says. “Because according to other people, they never do it right.” During his travels, he sometimes ended up in weird situations. He talks about his experiences, but also looks ahead to the future. Plenty is still to be done closer to home in Europe as well. “Everyone has their own methods, but if you’re doing it right, you’ll make weekly schedules. I sometimes visit ripening plants where they have to look into each ripening cell to see if bananas of a certain colour are available.” He sees room for improvement in that regard. Besides, when the market is doing well, all bananas are yellow, but when the market is disappointing, those same bananas are suddenly too yellow. “It’s difficult to make everyone speak the same language within the sector,” Frits says. To avoid the rising price of cardboard, the sector could decide to choose crates, something Frits researched with Willem Kokkeel some years ago. The benefit of crates is that they should save energy. Because air circulation is better, up to 30 per cent less energy is used during ripening. “That’s massive, but it’s not really getting through to people yet, because there are a few bottlenecks,” Frits says. Perhaps the smallest challenge: the crates are used as side tables in countries such as India, China and Indonesia, instead of being used to pack bananas. A bigger challenge is setting up a global pool system. “The bad thing is that a crate has to be returned to the plantation it came from, because growers are worried diseases or moulds are spread via the crates.” A third challenge is the relatively high price. Because of all of the transport, a crate is used six times per year. For the domestic market in India a crate would be used 20 times per year, making it a more appealing option. 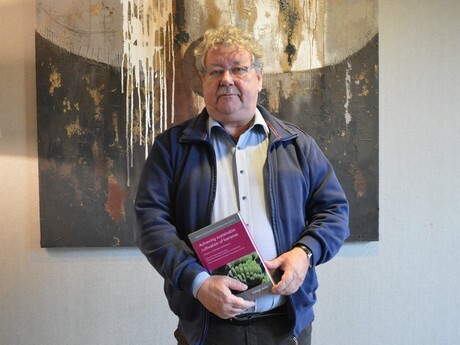 Frits summarised all knowledge of ripening he gained in his career in a chapter in the book Achieving Sustainable Cultivation of Bananas. “I’m proud to be part of that book. I’m not going to live forever, and it would be a waste if all of the knowledge I gained in the past 30 years were lost,” Frits concludes.